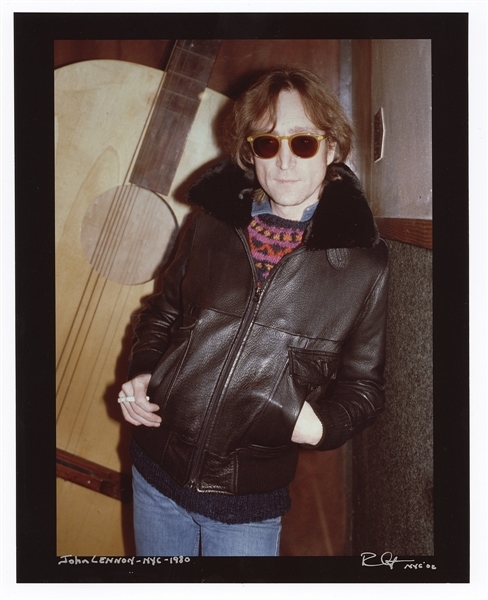 John Lennon is pictured here leaning against a wall, with an enormous "guitar" leaning against the wall behind him, wearing a brown leather jacket and sunglasses in this original photograph that has been titled by the photographer "John Lennon - NYC - 1980" and signed by the photographer with the date "NYC 02", in silver paint pen, at the bottom. The photographer took the photograph in 1980 and this is a print made from the original negative that was printed in 2002. Measures 8 x 10. Very good condition. Comes with a Gotta Have Rock & Roll™ Certificate of Authenticity.